Airborne Arms LLC and other marks indicated on our site are trademarks owned exclusively by Airborne Arms LLC. The use of these trademarks and trade dress is prohibited if used in connection with the sale of any product that is not Airborne Arms LLC’s, in any manner that seeks to disparages or discredit Airborne Arms LLC or in any manner that may cause confusion among our customers. All content on this website is the exclusive property of Airborne Arms LLC. Said content includes text, graphics, logos, icons, images, audio and video clips, digital downloads, and software. Our content is protected by United States and international copyright laws and we reserve all rights contained therein. In case of dispute or infringement, we will rigorously defend our rights to this material. Airborne Arms LLC grants you (the user) a limited license to access and make personal use of this website. This license does not include the right to download any material (other than routine page caching), modify any material, or any portion thereof, without the express written consent of Airborne Arms LLC. This license excludes the download or collection of logos, product descriptions, pricing, text, graphics, audio and video clips, and/or copying account information. This website or any portion of this website may not be reproduced, duplicated, copied, sold, visited, or otherwise exploited for any commercial purpose without express written permission of Airborne Arms LLC. You are prohibited from using meta tags or any other hidden text utilizing Airborne Arms LLC’s name or trademarks without the express written consent of Airborne Arms LLC. Any unauthorized use of this websites voids the limited license granted by Airborne Arms LLC. If you do post content to this site or otherwise submit material (including, but not limited to, photographs and testimonials), you grant Airborne Arms LLC and its affiliates a nonexclusive, royalty-free, perpetual, irrevocable right to use, reproduce, modify, adapt, publish, translate, create derivative works from, distribute, and display such content throughout the world in any media. By your submission you represent and warrant that you own or otherwise control all of the rights to the content that you post; that the content is accurate; that use of the content you supply does not violate this policy and will not cause injury to any person or entity; and that you will indemnify Airborne Arms LLC or its affiliates for all claims resulting from content you supply. Airborne Arms LLC reserves the right to remove any content at our sole discretion. This site is provided by Airborne Arms LLC on an “as is” and “as available” basis. Airborne Arms LLC makes no warranties, either expressed or implied, as to the operation of the site or the content contained therein. You expressly agree that your use of www.Airborne Arms LLC.com is at your own risk. Airborne Arms LLC cannot warrant that this site, our servers, or email communications affiliated with the use of this website, are free from viruses. Airborne Arms LLC will not be responsible for any damages of any kind resulting from use of this website, including but not limited to direct, indirect, incidental, punitive, and consequential damages. From time to time, Airborne Arms LLC offers its clients special offers and discount codes to be used in conjunction with this website. These offers are frequently disseminated via this website and through email to those who have registered for our email database. They are sometimes posted on our homepage (www.Airborne Arms LLC.com) or announced via other means of communication in conjunction with the promotion of the Airborne Arms LLC product collection, including radio and TV broadcasts, internet forums and various online websites. By visiting www.Airborne Arms LLC.com, you agree that the laws of the state of Minnesota, without regard to principles of conflict of laws, will govern these Conditions of Use and any dispute of any sort that might arise between you and Airborne Arms LLC. Airborne Arms LLC reserves the right to modify, alter, delete and update these policies at any time we see fit. Such alterations do not nullify our rights if infringements or breaches occurred under a pervious version of these conditions. Airborne Arms LLC operates out of Minnesota and only ships within the United States. Airborne Arms LLC adheres to all state, and federal laws regarding the sale of firearms and firearm accessories to people in the Untited States of America, including any export and legal restrictions. Check with the ATF for a complete list of the laws for your state/region. Airborne Arms LLC reserves the right to delay or cancel orders to states with prohibitive gun laws ie – California, New York, and Connecticut. All Firearms must be shipped to a valid FFL. The address listed on the FFL must match the address that the firearm is shipped to. Stripped lower receivers are considered firearms if they are more than 80% finished. Orders of “in stock” product received by 9:00 AM (Central Time) Monday-Friday are typically processed and shipped within 2-3 business days. Airborne Arms LLC cannot and will not guarantee a specific delivery date for any order. If you have limited delivery availability, we can arrange to have your order held at a nearby UPS facility to pick up at your convenience. Don’t wait until items that are “Out of Stock” are back “In Stock” to order. Ordering now will ensure you a place in the back-order shipping log. In most cases, you will receive back ordered items in a week or two. During high demand seasons, some items may continually be listed as “Out of Stock” only because they can’t be shipped immediately at the time of order but are arriving every week and still ship within 2-3 business days. All orders will be processed on a chronological basis dependent on order date. You will be notified immediately if an item is on back order and cannot be shipped within a timely mannor. Prices and specifications are subject to change without notice due to production and labor cost fluctuations. Keep damaged packages and all of their contents Including Shipping Materials. Please call, text, or email us within 5 business days of the delivery (ryan@airbornearmsllc.com – 763-464-4667) so that we can initiate the freight claim process with UPS and discuss replacements. Failure to contact us within this time frame will prevent us from filing a freight claim. Airborne Arms LLC will accept returns of unopened merchandise within 30 days of purchase for exchange or online credit. Any opened merchandise can be returned within 30 days of purchase and will be charged up to a 20% restocking fee and refunded with online credit towards future purchases. If you receive incorrect or defective product, Airborne Arms LLC make every reasonable effort to make it right; please contact us at (763)464-4667 or email support ryan@airbornearmsllc.com with your order number/receipt and pictures of the problem. Airborne Arms LLC does not accept returns or exchanges of any of our products purchased from another source. You must contact the vendor that you purchased from to discuss their return and refund policy. We strive to make the highest quality barrels possible for our price point. Every additional step and quality check that we take in our manufacturing process strives to deliver sub MOA accuracy, however performance is dependent on factors such as shooter skill, environmental influences, optics, maintenance, and especially ammunition. While reliability is our first focus, we cannot guarantee perfect performance with every type and brand of ammunition on the market. Just like jumping out of a perfectly good airplane with a parachute packed by someone you’ve never met, handling firearms involves a certain amount of unavoidable risk. Minimizing this risk is the responsibility of the shooter. If you are unable to accept responsibility of your actions, firearms are not for you. Using custom components may void your manufacturers warranty. Airborne Arms LLC strongly recommends that you have any modifications to your firearms checked by a qualified gunsmith. Airborne Arms LLC follows all local and state laws that are outlined by the ATF. We will ONLY ship to a valid FFL. You must be 18 or older to purchase rifle or shotgun ammunition and 21 or older to purchase handgun ammunition. All ammunition will be shipped ground with adult signature required. Always make sure to use the correct ammunition for your specific firearms and check your local laws for any other regulations. 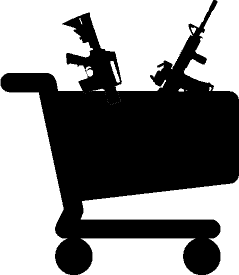 All firearm and ammunition sales will comply with local and state laws and will not be shipped to any restricted areas. No liability is expressed or implied for damage, injury or death resulting from the improper use or misuse of any Airborne Arms LLC firearms, components, or firearms modified with Airborne Arms LLC Components.